The city of Mahala isÂ a vertical metropolis, walled by mountains and founded on trade and magic. However the king is long dead, his pain mages were banished, and now the city is run by the Ministry in the name of the Goddess. The Ministry rules from the heights whilst the poor live in squalor on the lower levels.Â Rojan Dizon finds missing people and keeps his head down in order to hide his forbidden ability draw magic from pain. Then he receives a desperate message from his estranged brother, who did very well for himself but was recently attacked for reasons unknown. Going against his usual cynical self-interest Rojan agrees to help and ends up travelling to a strange part of the city where the rules are very different. He must rely on new allies whose agendas seems to match his own, at least at first. Rojan discovers the dark secret that the Ministry keeps hidden from most of the population. When thinking of fantasy settings where status is linked to height , Gormenghast is perhaps the most classic example. Itâ€™s an idea which creates striking visuals and itâ€™s easy to understand a social hierarchy that is literally stratified. The city of Mahala has a definite towering quality, though it is grittier than the gothic tales of Mervyn Peake. The other setting that Mahala reminded me of was Thaiburley, the city of a hundred rows in City of Dreams and Nightmare by Ian Whates, which was published in 2010. Thaiburley is another fantasy city where the rich live in luxury at the top and the poor are relegated to increasingly squalid levels below, though Whateâ€™s story has a very different tone. Mahala is very much its own world and contains many original ideas, plus we see the city entirely through Rojanâ€™s eyes. He occupies what seems to be the lower-middle levels of the city, which means he has seen sky a few times, but normally he travels lower to carry out his work. Most of the action takes place in a part of the city, where all the rules are different, so Rojan is able to take the position of outsider and the audience learns about the city through Rojan comparing what he knows to the new environment he finds himself in. The worldbuilding in Fade to Black cannot be faulted, there is enough detail in the book to create a very strong sense of place throughout. As the title suggests it is a setting full of greys, both literally -sunlight is non-existent in the lowest levels- and morally, as Rojanâ€™s cynicism tinges most of the story, and discoveries about the world get darker. The technology level of Mahala is industrialised, and the factories are important to the cityâ€™s existence, though itâ€™s clear that certain areas (including weapons tech) developed at different rates because of the social structure of the city. The wider world is hardly mentioned and even though it must exist there is little detail of lands beyond Mahalaâ€™s crowded mountain pass. The story is told in first person point of view by Rojan and the reader spends the entire book inside his head. Rojan is not a heroic type and his cynicism could be wearing if he were not such an entertaining character with a healthy vocabulary of curses and pessimistic metaphors. 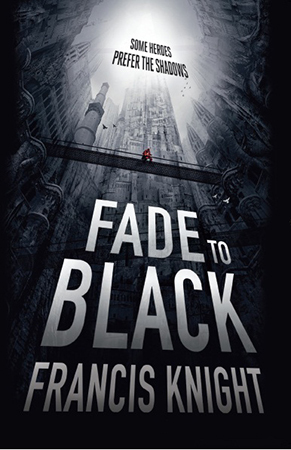 As it is Francis Knight has done a good job of creating a character who is not exactly likeable, but is definitely interesting. Even if the reader doesnâ€™t agree with Rojanâ€™s viewpoint or decisions, he is upfront about why he is the way he is, and a strong vein of self-deprecation makes him sympathetic. One of the interesting things about Rojan as a fantasy character is that he is a magic user by birth, but not by choice. His fear of using his own magical abilities is only partly fuelled by fear of pain or official reprisals, and is mostly driven by the way magic can take mages over, leaving them with little sense of self. Rojan may not particularly like himself, but his first instinct is to protect what he is at all costs. Thereâ€™s a reasonable cast of characters all fairly distinctive, though the ones Rojan already knows donâ€™t get as much attention as those he meets on his unexpected quest. The most important of his new allies are Pasha and Jake. Pasha seems young and uncertain but he can be deadly when angered. He and Rojan spend much of the book sizing one another up with each not quite trusting the other. Pasha is described as being monkey-like and Rojan is able to use this analogy to aptly describe the different facets of Pashaâ€™s character. Jake is a female gladiator with cherry-red hair and a steely commitment to her cause. She and Pasha use Rojan because his aim fits with their much grander and more altruistic plans. Both have been badly damaged â€“physically and mentally- by their crusade against the horrors of their society and the things they have seen. Both have very strong faith, which isnâ€™t compatible with Rojanâ€™s nihilistic outlook. Many of the scenes in this book involve interactions between characters who are psychologically damaged and very guarded, and itâ€™s a testament to the authorâ€™s skill that they are compelling enough for the audience to care despite the barriers the characters throw up. The story is brutal in places, with revelations bad enough to deeply shock Rojan through his shield of cynicism, though the truly dreadful deeds are implied and referred to rather than shown. The story focuses on the aftermath of violence and abuse, on what happens to those who have lived lives rules by fear. There is a lot of focus on consequences, both those that have already happened, and those that might happen as a result of certain actions. There are several plot twists, most of which are well done and make a lot of sense in the context of both the story and the setting. The final reveal about the villain seems clichÃ©d, and though itâ€™s handled well within the story I began to suspect it might be coming simply because itâ€™s a very familiar plot device, meaning that there was a certain inevitability about what came next. This is the main flaw in the book, and it didnâ€™t particularly spoil my enjoyment. 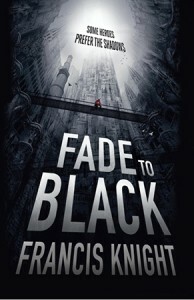 Fade to Black is a dynamic and original introduction to a world and character that promise further exciting stories. I would recommend the book to those who enjoy dark fantasy, hard-boiled protagonists and stories unafraid to examine the dark side.